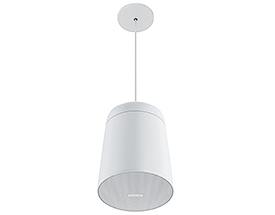 Extron Electronics, a world leading company in the field of audio visual solutions, have this weeks announced the immediate availability of the Extron SF 26PT two-way SoundField Pendant Speaker. Essentially an enlarged version of the company’s existing SF 3PT speaker, the new SF 26PT is described by Extron as a two-way pendant loudspeaker for high performance program or music playback in high-ceiling and open-ceiling applications. As is the case with the smaller SF 3PT, the new Extron SF 26PT takes its inspiration from modern pendant lighting and an architecturally clean, patent pending design that complements the aesthetic of contemporary interiors. In keeping with the idea of making the new pendant speaker suitable for as many different interior styles as possible, it is offered in both black and white and can even be painted to fit in with any décor style. In order to provide a finished installation that is clean and secure, the new Extron SF 26PT includes an Extron-exclusive PendantConnect speaker cable, which combines the speaker wires and steel support cables within a single outer jacket.